The Vibraforce® process is based on a vibratory effect that maintains and keeps the product’s life. Its vibratory effect allows a dynamizing interaction with our cells once the product is consumed. This dynamization process is used during the product manufacturing by incorporating dynamized active matter in formulas and using other vitalizing treatments at different stages of their making. 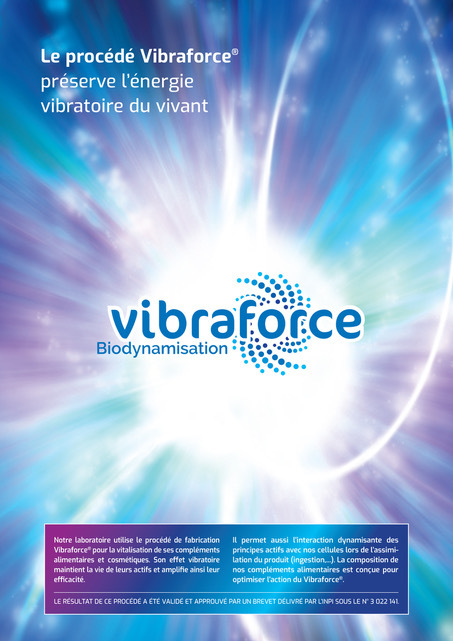 All plant extracts and food supplements currently produced at Vibraforce® Laboratories benefit from this “bio-dynamization” process. Vibraforce®’s effect is a wave radiation resonating with organic structures and especially minerals contained in intracellular liquids of each living cell. Vibraforce® is an informational process similar to homoeopathic principles (James Hahnemann, Dr Korsakov). The mineral radiant field or the natural ionizing principle affects water’s molecular structure by creating “cocoons”: water molecules assembling together in networks preserving information. The same water molecule submitted to the Vibraforce® field can change its energetic and structural state by modifying electromagnetic charges between water molecules (interactions). Thesigraphical and Kirlian biophysical measurements are consistently made all along the manufacturing process in order to validate the effects and the level of our bio-dynamization action. Control and optimization tests of the effects of the Vibraforce® radiation are also done on products. All living organisms are sensitive to the action of Vibraforce® . The action of Vibraforce is long-lasting and its intensity is linked with the original energetical state. We have also assessed the impact of the Vibraforce® process by the crown effect (biophotonical).